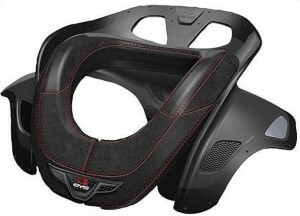 Introducing the new RC-EVOLUTION race collar system. Providing the ultimate in neck protection, the RC-EVO has been designed from its inception with the assistance of top orthopaedic professionals to reduce neck compression and extension related injuries (the cause of serious spinal chord damage). This new design uses an entirely new and innovative combination of Absorption, Diffusion and Deflection of Impact Energy mechanisms not seen in other popular neck protection devices. The RC- EVO has a customizable ergonomic fit that works with the driver to ensure comfort and maximum impact protection. Reducing overall weight and bulk, the vented design allows air to move freely through it, helping to keep you cool. 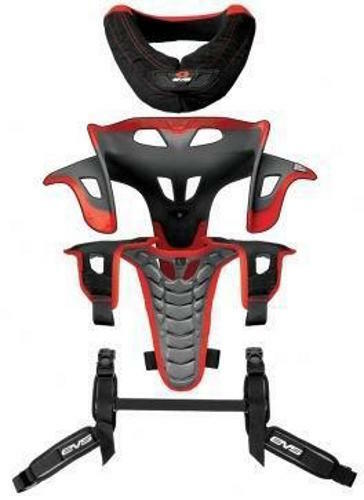 The RC-EVO offers more effective load transfer to the shoulders, and deals with filling the space between helmet and shoulders more effectively than other devices. 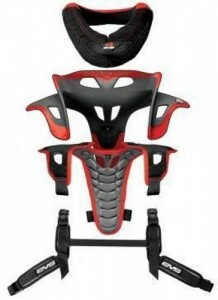 It avoids putting unnecessary pressures on the upper body in otherwise benign crashes. The RC-EVO offers the driver other benefits such as: comfort, simplicity of use, adjustability, low weight, low bulk.